At 2 and a half years old Emily has finally discovered squirrels. Like her pack mate Rufus, today she was obsessed. Emily now (like Rufus) suffers from Squirrel Attention Deficit Disorder (SADD). She watches those trees like a hawk. Does your dachshund have SADD!?? 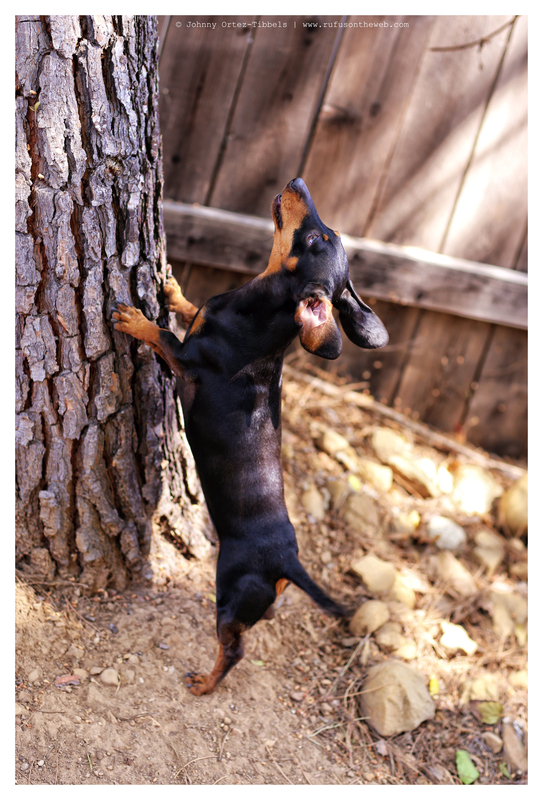 This entry was posted in Emily and tagged #ADachshundsLife #HappyHounds, #black and tan dachshund, #dachshund, #smooth dachshund, #SquirrelHunter #SquirrelChasing, doxies. Bookmark the permalink. Yes, my Duke had, LADD (lizard deficit disorder). Great hunters!! Emily is going to get that squirrel!! I had a half blue heeler he was small and was always treeing them. Spud died on the way to the vet in Feb. 2008. He had blue ears and blue eyes. I miss him so much. Yes, we have a couple that have SADD and/or it’s equivalent SO (Squirrel Obsession) !! My Chihuahua MitzeeLu suffers from SADD. She chases the squirrels all the time. Yes, my Willie has SADD! But the worse she has is JO (Jackson Obsession)! Jackson is the dog next door…they bark at each other under the fence. They neighbor and I have tried to stop them, but we decided they have so much fun, we’ve let them go. There is 2 feet between the fences, so their noses will never meet…kind of like the squirrels! Dori has it!! 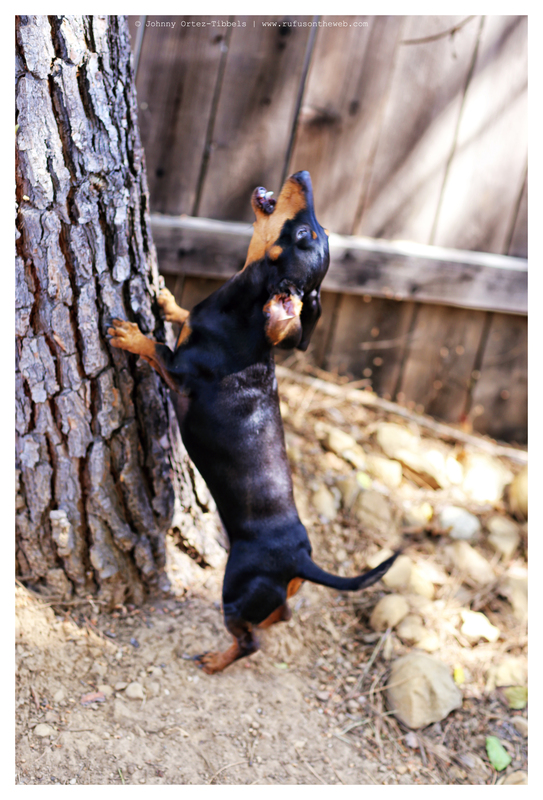 she has been known to sit at the bottom of the tree & not move for, get this….5 hours!!!!!!! Her attention span is amazing!!! Thank you! We love producing it for our dachshund friends near and far. Enjoy!!! Zoe loves anything that walks crawls or flys. Her big thing is that she has come down with the case of the BADD (bug attention deficit disorder). She will chase and play with a bug for hours. She loves to pick them up and throw them in the air and catch them. She is so cute. My Trot Nixon has SEVERE SADD!! When we don’t open the back door quick enough, he gets all fired up and when the door opens he shoots out like a bullet making this hilarious screeching sound. It almost sound like he’s being abused! We have about a half acre fenced in, so a lot of trees – and he has to check every. single. one. – and a hollow stump – before he’ll even consider coming back in. If a storm has blown branches and clumps of leaves down to the ground, they must be closely inspected – bc they smell like squirrel! What’s truly hilarious is in the fall, the squirrels throw acorns at him. And often hit him square on the noggin.